Proper skincare begins at home. The skin is the body’s largest organ. If we don’t take care of our health, it shows through in the condition of our skin. In addition to proper exercise, a healthy diet and lifestyle, balanced hormones, a high-quality skin care regimen will help your skin stay young and healthy looking. We offer a large selection of medical grade skin care products including potent and absorbable anti-oxidants, powerful peptides, lightening creams, exfoliants, advanced moisturizers, growth factor technology, revitalizing eye creams and most importantly advanced sunscreens that are packed with active ingredients to allow your natural beauty to shine through from within. DefenAge Skincare is the only skincare with Age-Repair Defensins®, a patent-pending peptide complex known to communicate directly with skin’s Master Stem Cells to unlock the skin’s age-corrective potential and significantly improve skin’s barrier functions. 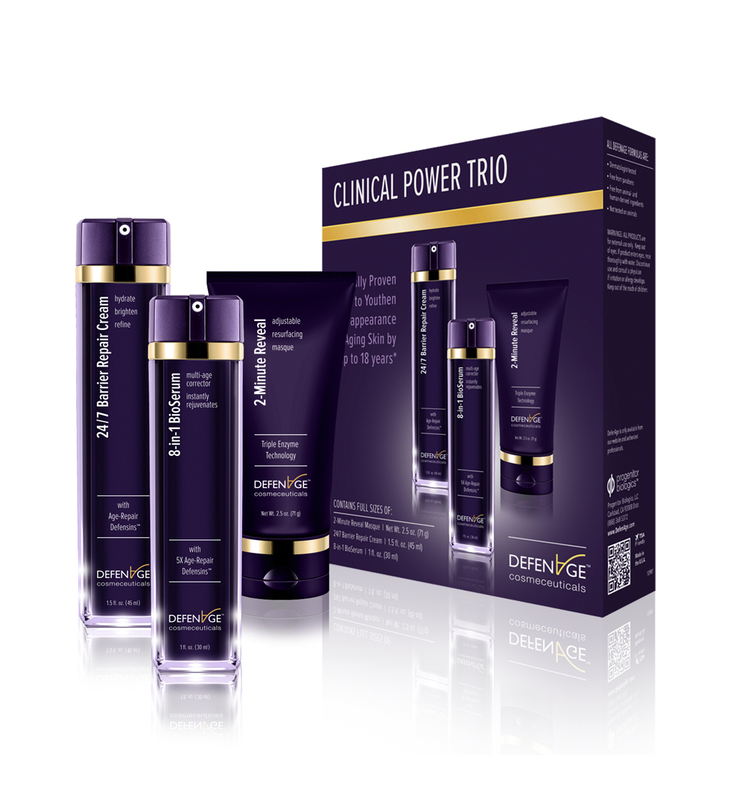 Clinical studies show visible age correction of up to 18 years in just six weeks using the three-piece Clinical Power Trio. • 2-Minute Reveal: Gentle warming cream masque infused with ultrafine Sugar Crystals and Triple Enzyme Technology. 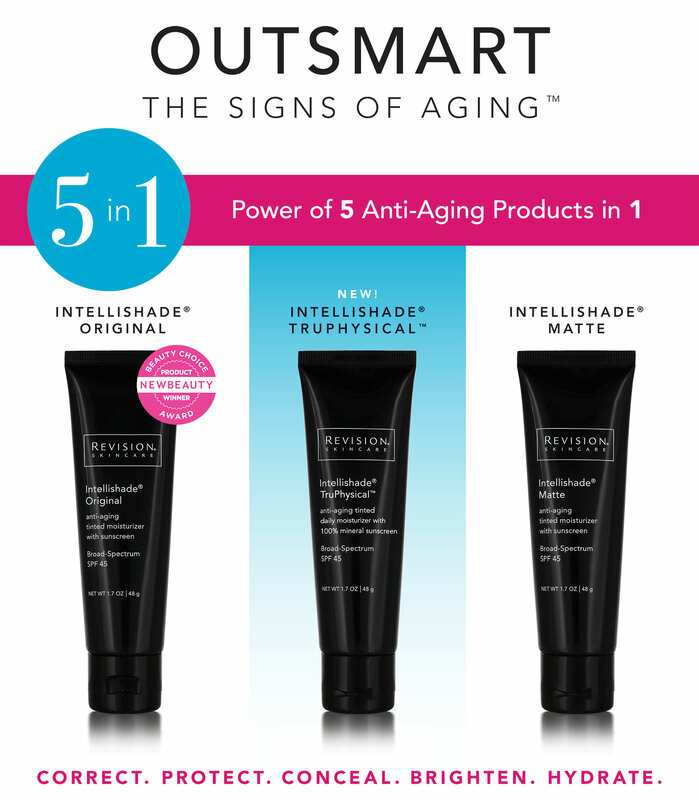 Instantly resurfaces, refines and reveals younger-looking skin. Brightens and intensifies radiance. Minimizes pores, discoloration, and fine lines. • 24/7 Barrier Balance Cream: Ultra-hydrating lightweight cream infused with Age-Repair Defensins, multi-action barrier repair, and brightening ingredients. Starts repairing skin’s barrier within 24 hours. Revives radiance and youthful texture for a remarkably smooth, even skin. Brightens, minimizes the appearance of age spots, calms redness and sensitivity. • 8-IN-1 BioSerum: Biologically advanced serum concentrate delivers results equal to 8 separate serums. ‘Smart’ formula understands your skin’s needs better than your own DNA. Instantly, rejuvenates smoothness. Within days, visibly rejuvenates radiance and hydration. Within weeks, minimizes the look of lines, wrinkles, pore size, age spots, and redness. Brightens overall skin tone and clarity. Calms signs of ‘inflamm’ aging’ and sun damage. Visibly revives youthful firmness and elasticity. Revision Skincare uses only the purest, premium quality ingredients in our products and sells them exclusively to physicians. Rare ingredients are sourced from all over the world. 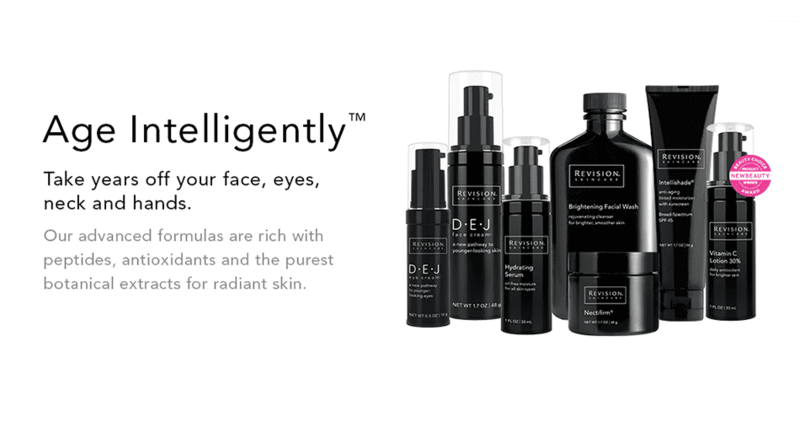 The Revision Skincare line is formulated to enhance the skin’s appearance and reduce the visible signs of aging. We carry their best-selling, clinically-proven, high performing products: Nectifirm Advanced (the #1 product for the Neck), Intellishade Tinted SPF 45 (comes in Matte, Original & TruPhysical), Retinol Complete, Brightening Facial Wash, Vitamin C 30% Lotion and DEJ Face and Eye Cream. Innovative Skincare, iS Clinical medical grade products deliver rapid and safe, long-term and impressive results. They are used by all age groups and all four skin types, sensitive (rosacea), hyperpigmented, acneic and environmentally-damaged. We carry their most popular products: ProHeal Advanced Serum, Cleansing Complex, Tri-Active Exfoliant, Extreme Protect spf30, and SHEALD Recovery Balm. Sunscreen is one of the most important products that one should commit to early in life. Preventing sun damage from ultraviolet rays is a key to anti-aging. Our broad-spectrum, medical grade sunscreens protect against UVA/UVB rays and are formulated to not only shield your skin from sunburn and photo-aging, but also to give your skin powerful hydration and antioxidants to minimize sun damage, wrinkles, radiation, sun burns and skin cancer. Sunscreen is vital to all skin types and conditions! All Day, Every Day. Sunscreen should be an essential part of your daily skin care regimen. Medical Grade Skincare Products can be used separately or in combination with our wrinkle reducing treatments, facial and body sculpting, Bio-Identical Hormone Replacement and other services in order to enhance their effectiveness and to achieve an overall youthful, vibrant look. Our Esthetician and Nurses will work closely with you to help evaluate your needs and create an individualized skin care regimen that is best for your skin type and goals. Get started with your healthy skin regimen today, stop in or call for a consultation.